Finally I have a raincoat! And pictures to prove it! This was the first of my “Bonus Items” in my sewing challenge. It took a bit longer than I had anticipated since my first pattern choice ended up failing at the muslin stage. And applying all the seam sealing tape made pressing take longer than normal. And then trying to hem the rubber backed fabric by hand was sort of exhausting. But in the end I am really happy with my coat, and I am especially pleased with my decision to change my pattern and use Burda 7360 instead. It was easier sewing the rubber-backed material on the machine than I had anticipated, but I am still glad I chose a raglan pattern over one with set-in sleeves. Using a sharp microtex needle and teflon presser foot was really helpful for sewing this fabric as well. I am also happy that I was able to find a belt buckle that matched the buttons I had selected. With the minor alterations I made, the fit turned out really great, and I love my finished coat. So much so that there are tons of pictures. Tons. The back with a vent. And now for my addition – a hood! It is a raincoat after all. How the coat hangs unbuttoned. The lining shot (and my LBD). Hood is attached with plastic separating zip. 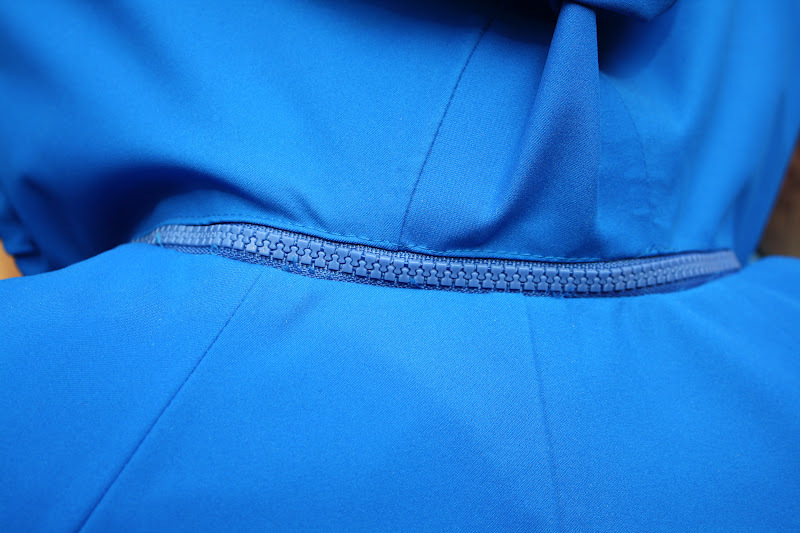 Collar without hood – I am very pleased with the shape and stiffness. The vintage buckle from Etsy. Pattern Description: Burda’s description: Raglan coat in classic form or youthfully casual, cinched at the waist with casing and tie belt. 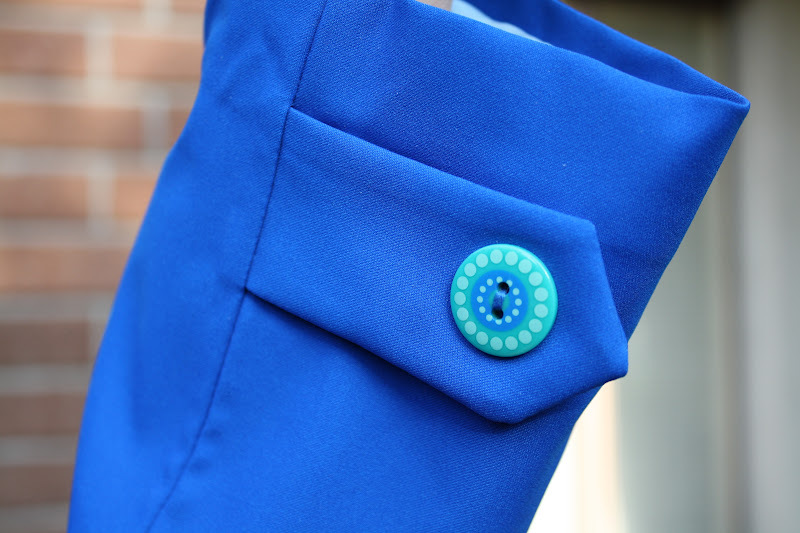 A has a concealed front button band and collar, B has snap fasteners and a standing collar. 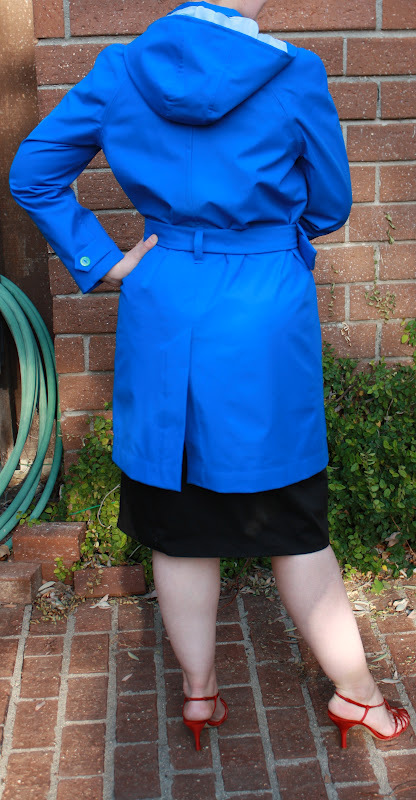 I made view A – the classic style trench coat. 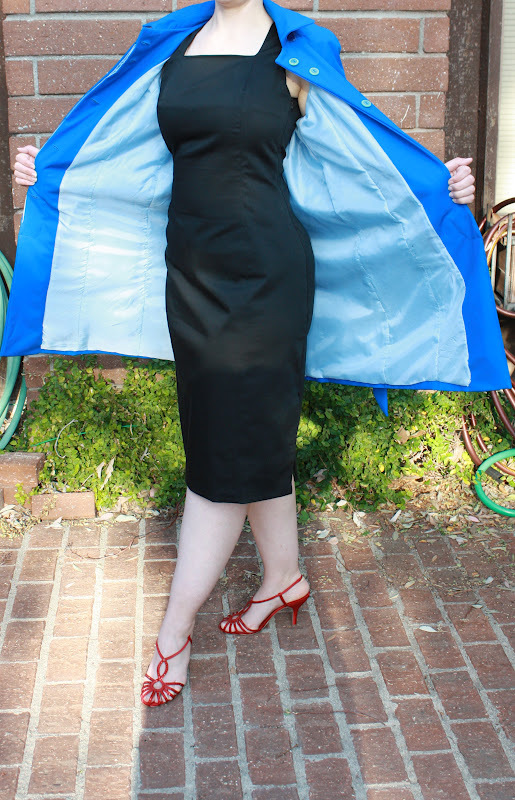 Pattern Sizing: Burda envelope sizes 36-48 (American sizes 8-20). I made a size 40 (14) but I did add some width to the lower back. Were the instructions easy to follow? Yes, I thought the instructions were quite straightforward. I think the Burda envelope patterns are a great option for someone who wants to try Burda patterns but are worried about the spotty instructions in the magazines. The envelope patterns have the same great drafting, but the instructions are more thorough and have great pictures as well. Did it look like the photo/drawing when you were done with it? Yes, very much so! I did have one addition (a removable hood), but other than that my results look very similar to the line drawing and envelope photo. I think this is a great pattern – looks really good when it is completed and very flattering. What did you particularly like or dislike about the pattern? 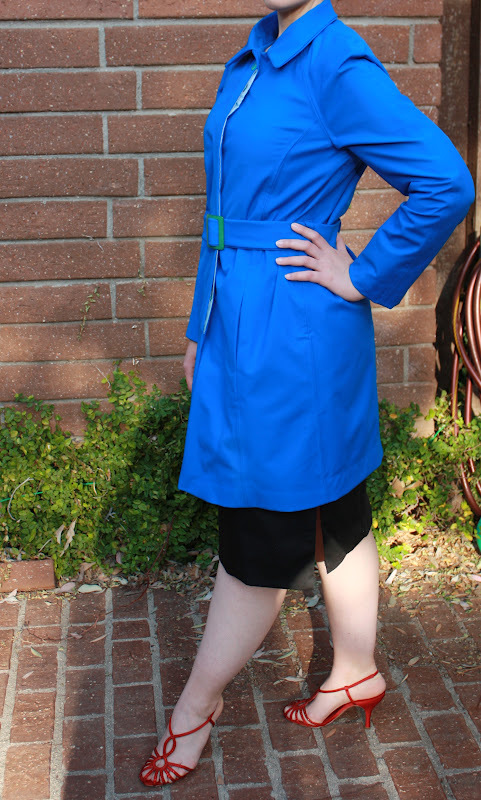 I had a lot of likes: I loved the style – it is a very sleek and modern looking trench coat style. I loved the collar, which is quite sturdy because it is drafted with a collar stand. I also like the concealed buttons. The drafting, as per usual with Burda, is wonderful. And this pattern even includes separate pattern pieces for the lining, which is really nice. Dislikes: This is pretty minor, but the pocket bags are a bit large for the size of the coat. 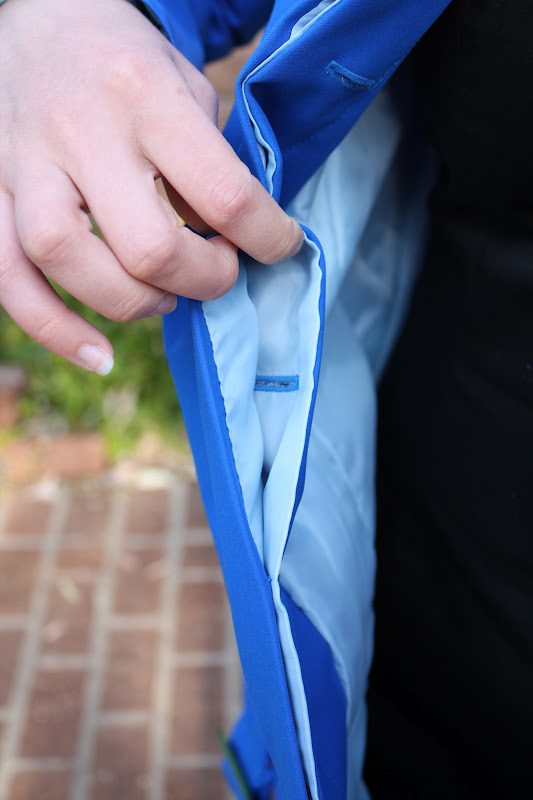 I mean, I like the large pockets, but they do bunch up a bit inside the coat because they are a bit too wide to fit smoothly. Fabric used: The outside is a rubber backed material I found at Hancock Fabrics. I used a seam-sealing tape to water-proof the seams. This did leave the seams a bit more puckery than I would have liked, but the tape does do a nice job of preventing water from leaking to the inside of the coat. Because of the rubber backing, I used a sew-in interfacing instead of a fusible. 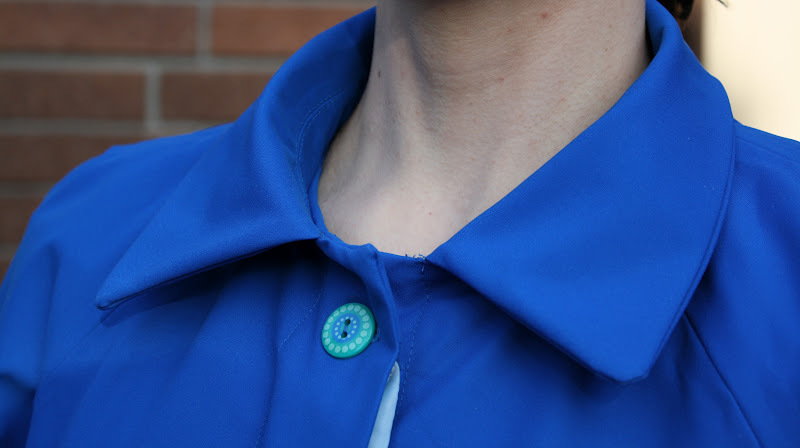 It was actually a stiff polyester fabric I had bought from the Joann’s red tag sales, and I think it does a great job providing just the right amount of stiffness in the collar. On the inside I used a thin polyester lining that was also from Hancock Fabrics. Pattern alterations or design changes you made: I made a few alterations for fit. I added an inch of length at the top lengthen line. I also widened the back pattern piece by 1.5 inches below the waist line so that the side seams would fall straight. Finally, I raised the pocked placement by 1.5 inches (one inch to counteract the extra length I added to the top, and half an inch because I felt the placement was too low to begin with). Finally, I made one major design change – I added a removable hood. I used the BWOF 05-2002-123 pattern which has a pattern and instructions for a hood that is attached by a separating zipper. The zipper is sewn into the seam for the collar, and though it makes the neck a bit stiff I really like that I can wear the coat without the hood most of the time, and zip on the hood when it is raining. Would you sew it again? Would you recommend it to others? I think I might sew this again! I love the modern sleek style. 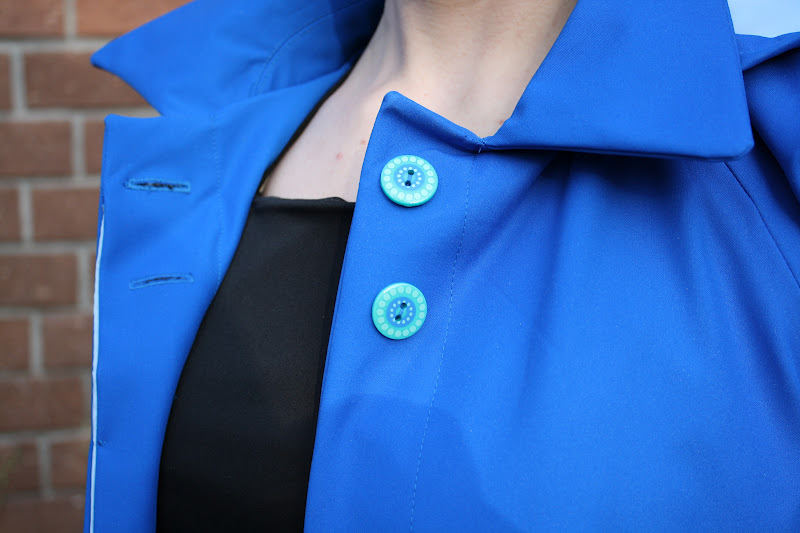 And I plan on re-using the instructions for the concealed buttons in an upcoming project. 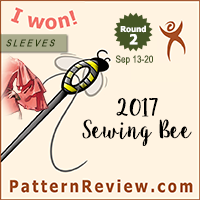 I would highly recommend this pattern to others – it is well drafted, easy to sew, good instructions, and a great modern version of a classic style. Conclusion: I LOVE this pattern! And I LOVE my coat! Although there are a few minor complaints, I really couldn’t be more pleased with the results. I have a lot of coat patterns in my stash that I want to try out, but I think I might return to this one again in the future. 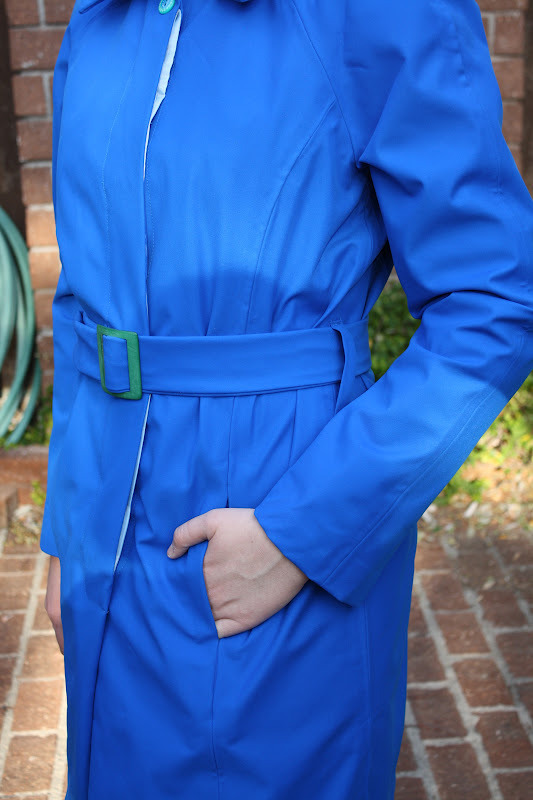 Highly recommended to anyone looking for a sleek trench style. And that is my first sewing challenge bonus item down! 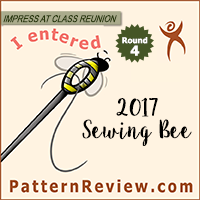 Things are progressing a bit more quickly than I anticipated in sewing land, so I may be re-evaluating my sewing plans for next week – stay tuned! Fab coat! The first thing you notice is the zingy, blue colour. Lovely on a dull rainy day. 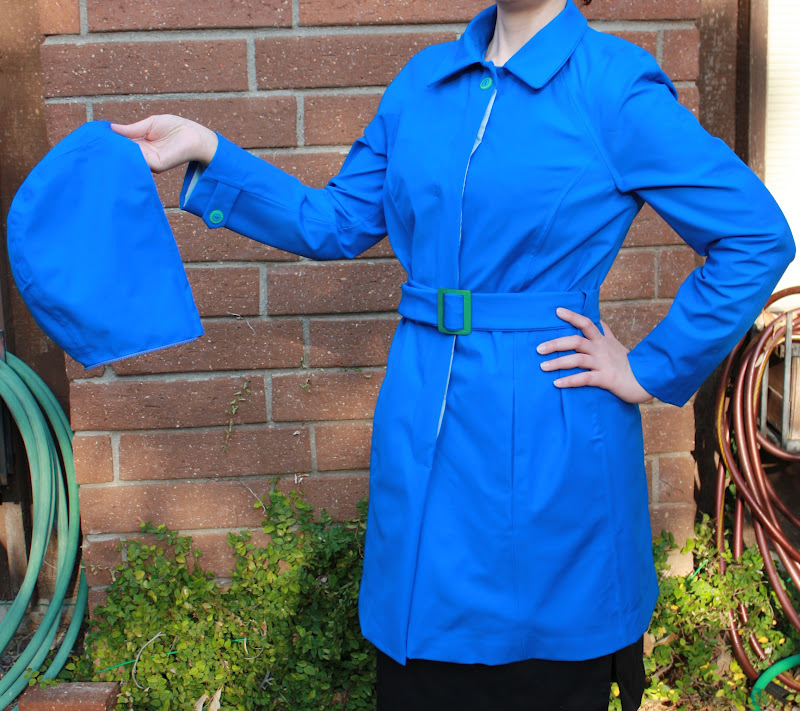 I love your raincoat, the bright color, streamlined silhouette and clever way you attach the removable hood. It is the perfect coat to cheer you up on a gray, rainy day. Yaaay! Just catching up on blog reading today. 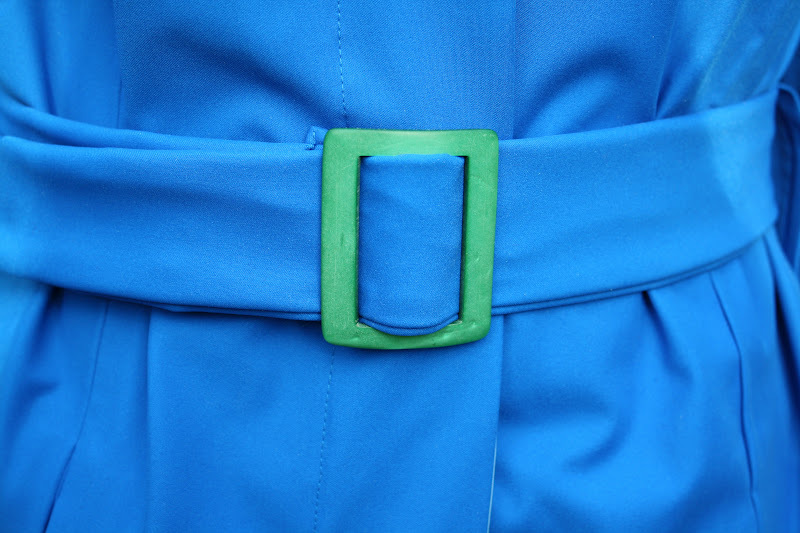 I LOVE your smurfy trench – there are so many great details! Cool that the hood zips off!